Egyptian themed slot games seem to have endless popularity with gaming fans. There is something mysterious and attractive about the ancient Egyptian world. Legend of the Nile combines three special symbols, a power meter system, a progressive jackpot and great graphics into an excellent pokie. BetSoft have developed this pokie with their usual care and effort. The diverse bonus features and unique reel design offers some exciting fun. The 6×6 reel grid makes use of cluster pays to award players with payouts. BetSoft have published this pokie’s RTP at 95.62% which is also offset by the progressive jackpot. All in all your pokie experience will be very fulfilling as Betsoft have managed to include everything you will want and expect from a quality pokie. Despite the use of a popular theme you see on many pokies, Legend of the Nile still manages to be able to keep its head above the competition. Legend of the Nile features 3 gods who play a role in the game’s main bonus feature. Isis, Ra and Anubis are the gods who can add special features to the reels depending on how much you can fill their power meters. When you look to the left of the slot reels, you will see each god with a meter next to them. Each time you form a winning combination featuring one of these gods the meter will fill up and apply a variety of effects that range from free spins to cash prizes. Additionally these meters can also increase the value of the Isis, Ra and Anubis icons so the more you win the more you win. The Pyramid Wild symbol adds even more wins for players by substituting for the standard reel symbols. The wild icon can also pay out a massive 30 000 coin jackpot. 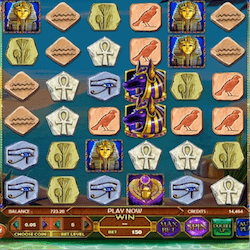 Legend of the Nile also includes an Exploding Wins feature to the Cluster Pays system for massive rewards that can happen consecutively. With each Cluster Pay win, all the matched symbols will explode, leaving a gap on the reels. All the symbols above this gap will then fall down forming new combinations. These exploding reels can and will happen consecutively. Finally Betsoft have included gamble features which will double your standard payout. There are so many features and options included in this slot that you can’t help but have a great time playing it.